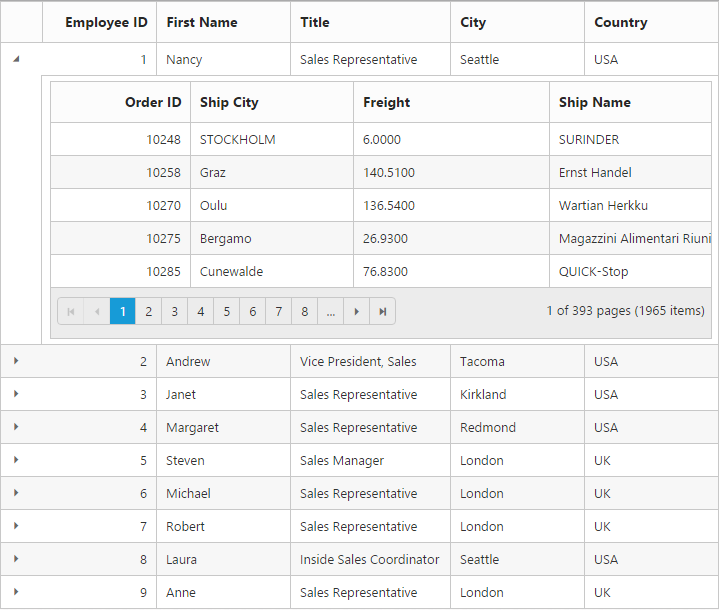 Hierarchical binding can be used to create the Grid with parent and child relation, this facilitate you to view the child records for a particular row by clicking on the Expander button present in first column of each grid row. This can be enabled by defining childGrid and childGrid.queryString. childGrid is to define options of child and childGrid.queryString is to define the relation between parent and child grid. The Grid’s responsive and exporting support is not applicable for Hierarchical binding. The Grid can able to expand and collapse all the childGrid through programmatically using expandAll and collapseAll method. while detail template row is clicked to expand detailsExpand event is triggered. while detail template row is clicked to collapse detailsCollapse event is triggered.